Rabid Rabbits - A competitive party style combat survival game. 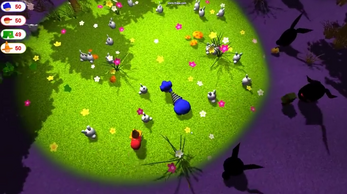 The rabbits turn into monsters outside of the light to attack you. Launch your spring loaded boxing glove, but time it right because it leaves you vulnerable to counter-attack. Engine: Unity 3. Players: 4 Players. Playtime: ~5 minutes.